The end of the year is usually a time for reflection. Commentators on Nicaragua are no different. Over the holiday period two excellent assessments appeared, one specific and one general. The first looked at Nicaragua’s relationship with the IMF. In Faint praise, bad faith and disinformation– Western pundits, the IMF and Nicaragua (see here for the full article) tortilla con sal analyses Nicaragua’s relationship with the International Monetary Fund. The country’s good working relationship with the body known for its neo-liberal zealotry has been a puzzle for some on the Left. 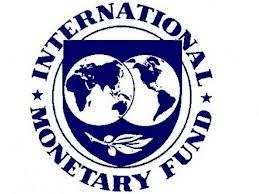 Yet again this autumn Nicaragua received a good, if qualified, assessment by the IMF. The article charts the history of the IMF, the nature of Nicaragua’s relationship with the financial organisation, and how the country has been able to avoid some of the pitfalls other countries have faced. By and large Nicaragua has ignored IMF ‘advice’ on social issues and tackling poverty, whilst maintaining the economic stability Nicaragua sorely needed. The second article is by Adolfo Pastran Arancibia (see here for Touchdown Daniel Ortega and the FSLN). There is no doubt that construction of the inter-oceanic Grand [shipping] Canal not only was the news of the year, but also the most emblematic project of the government, in which the HKND company and Wang Jing assume the investment risks, according to what he has stated. In the concession to Wang Jing, Nicaragua received 1% ownership upon signing the agreement and will receive US$100 million dollars in ten payments, after the first ship passes through, but after the tenth year, Nicaragua will receive 10% ownership, at 20 years 20%, and 30 years 30%. Upon reaching age of 50, Nicaragua will have 50% of the profits and from then there will increase to 99% ownership. The largest construction company in China, CRCC, has already done feasibility studies in Nicaragua. They are already working with the state-owned China Ocean Shipping Group Company, known as COSCO, one of the major shipping companies in the world and a state-owned company. In addition, the Chinese companies CIMC, expert in maritime transport and containers, XCMG, a construction machinery expert, CNBM another Chinese company dedicated to building materials with experience in mega projects, and the supervisory company of the Chinese Three Gorges hydroelectric mega project. These are the crème de la crème of Chinese construction companies. The release of feasibility studies and presentation of the route chosen for construction of the Grand Canal, the financial support achieved so far, and who will be potential investors in the project, will all be crucial at the beginning of the year to give credibility to the project. If the Chinese businessman, Wang Jing, delays this information further, (it was already postponed in December), it will begin to generate uncertainty and real doubts about the project and optimistic skeptics will become negative skeptics. Uncertainty around the canal would generate negative impact in attracting more investment in 2014. Everyone wants to know if the government and the military of China are behind the project and whether it will be possible or not. Further delay of these clarifications would result in loss of credibility. In addition, Wang Jing has the enormous challenge with his Xinwei Telecommunications Company of starting the TELCOR concession this year that he received a year ago to operate a third telephone service in Nicaragua. 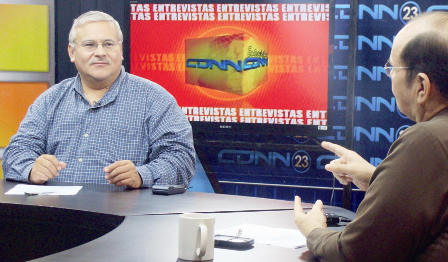 That also raises questions about the possibility and capacity of his company to build a Nicaragua canal, because Xinwei has planned to begin installing the telecommunications infrastructure in April 2013 and none of that happened. Xinwei is obliged to start the project this year or TELCOR must have the concession removed for breach of contract. Already the timetable is slipping, no great surprise with a project of this size. The same slippage is apparent in the other mega project slated for the next few years, the Tumarin hydro-electric dam (though this is dwarved in scale by the Canal). The opposition are already hoping the Canal project will be kicked into the long grass, along with the Sandinista government’s reputation. What seems to be overlooked is, even if the Canal doesn’t go ahead (and there remain serious questions about the environmental effects and the impact on indigenous communities), in the past 12 months Nicaragua’s decision- and policy-makers have undertaken a year long speed-dating session with some of the most dynamic companies in the world. So far Nicaragua hasn’t seen major Chinese investment, which sets it aside from many Latin American countries. These opportunities could yet arise, whatever the final decision on the Canal. The Campaign is launching a new appeal for the new year. 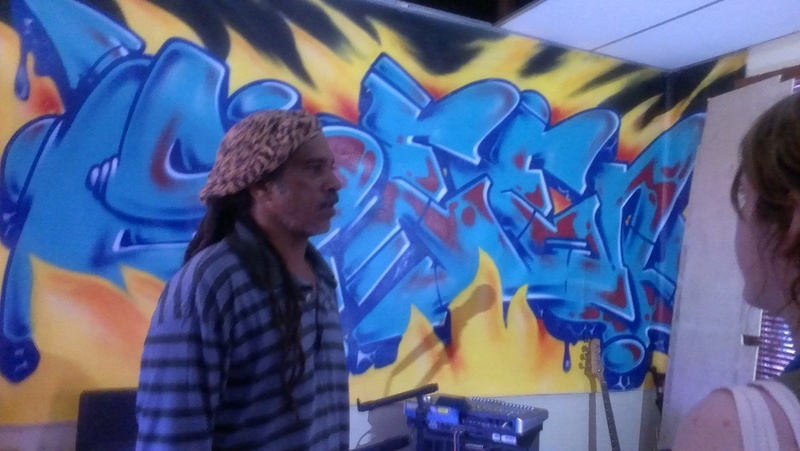 During 2014 we are raising money for the Bluefields Sound System. We have made several visits to the BSS during our visits, the last time in February last year. This time we had a bit of a shock, to hear ‘Croeso i Bluefields’ (‘Welcome to Bluefields) from Rocco, one of the volunteers with BSS. Rocco spent several years in South Wales at the start of the last decade. He travelled the Valleys, playing gigs and learning a smattering of Welsh! We are raising money to help support work with young people and producing Bluefields music. There is a rich tradition of reggae music, and more recently HipHop. You can hear more on the Bluefields Sound System website here. To give a donation, visit our fund-raising website here. For every person who gives £25, BSS will give 2 albums to download (contact us for the codes). 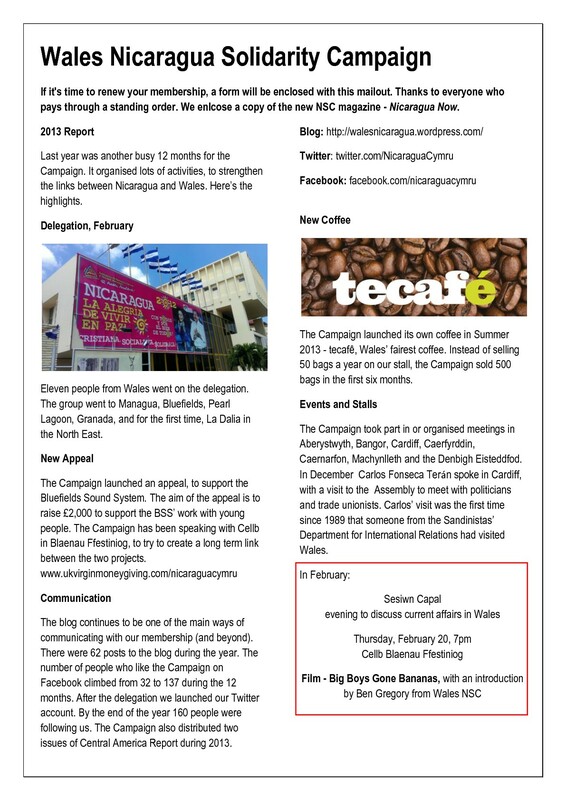 Mae’r Ymgyrch yn lansio apel newydd ar gyfer y flwyddyn newydd. 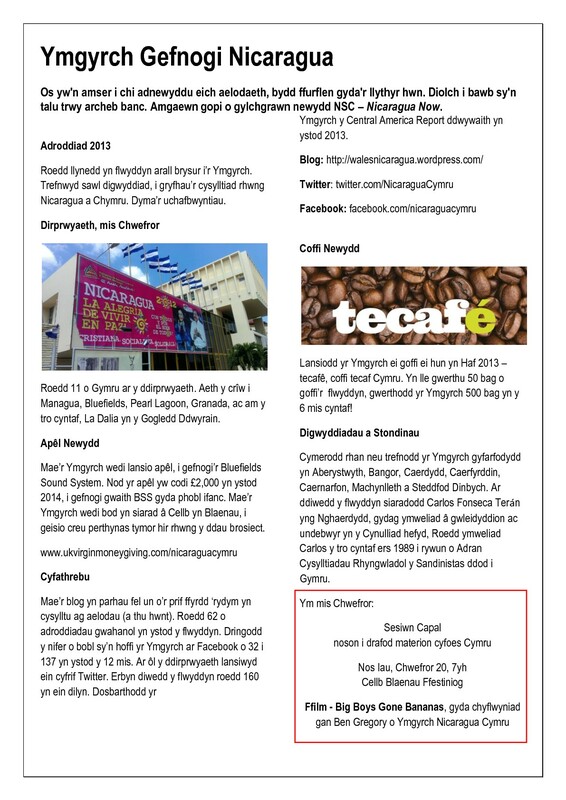 Yn ystod 2014 rydym yn codi arian ar gyfer y Bluefields Sound System. ‘Rydym wedi ymweld sawl gwaith a’r BSS yn ystod ein teithio, y tro diwethaf ym mis Chwefror llynedd. Y tro hwn cawsom dipyn o sioc, i glywed ‘Croeso i Bluefields’ gan Rocco, un o wirfoddolwyr y BSS. Treuliodd Rocco sawl blwyddyn yn Ne Cymru ar ddechrau’r degawd diwethaf. Teithiodd o gwmpas y clybiau, yn canu, a dysgu geiriau Cymraeg! ‘Rydym yn codi arian i helpu talu am waith gyda phobl ifanc a chynhyrchu cerddoriaeth Bluefields. Mae traddodiad cyfoethog o gerddoriaeth reggae, ac yn fwy diweddar HipHop. Gallwch glywed mwy ar wefan Bluefields Sound System fan hyn. I roi cyfraniad, ewch i’n tudalen codi arian fan hyn. 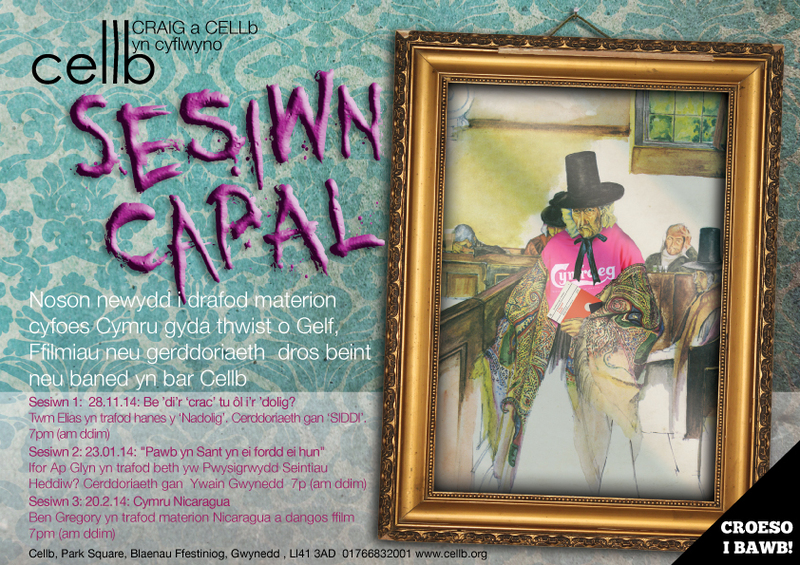 I bob person sy’n rhoi rhodd o £25, mae’r BSS yn rhoi 2 CD i lawrlwytho (cysylltwch a ni i dderbyn y cod).